BelEve UK and Black 100+ are excited to announce another highly anticipated event, which celebrates the journey of our elders, who came to England from the Caribbean during the Windrush era and have made their valuable contributions to the British Society in which we all live, work, study and play. ‘For Those Who Will Come’ is an intergenerational event which charts the journey of an inspirational and phenomenal woman; Mrs Mavis Stewart MBE, a vibrant 78 year-old much loved and highly respected pillar of the community, who was awarded an MBE by Her Majesty the Queen for her services to the community. Born and raised in Jamaica, we map Mavis’ early childhood and her journey to England in pursuit of her dreams to become a nurse, rising to the ranks of a senior manager, where she was able to be both instrumental and influential in shaping the NHS. We gain an insight into her community work to bridge the gaps between diverse groups, as well as her love and dedication to the development of young people. Hosted by Jacob Sakil (Former Young Mayor of Lewisham) and Sonia Meggie (Founder of Inspirational YOU). We will share Mavis’ amazing story through singing, poetry, dance, story-telling and through direct conversation with Mavis herself. Attending elders will be equally engaged by the past testimonials of special guests, which tap into their own memories, creating a legacy and a living history experience. 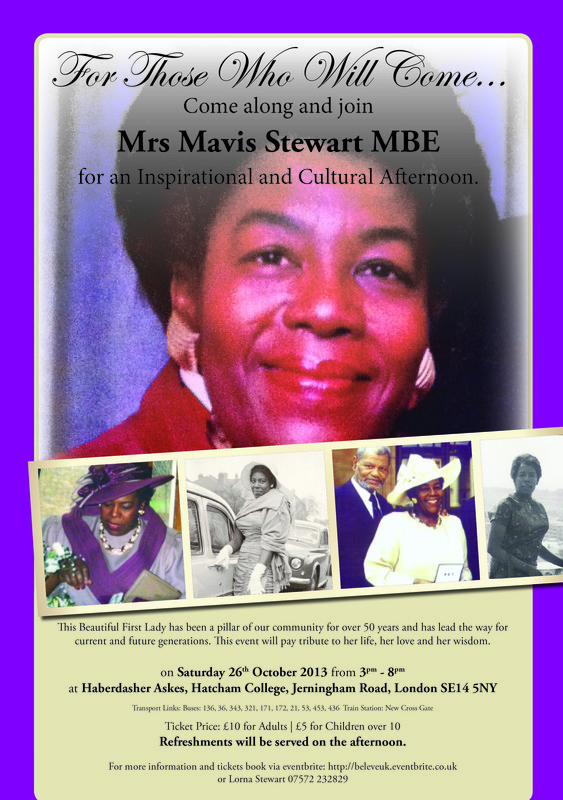 The audience will learn about Mavis’ upbringing, life, work, family, education and achievements. Also, about her, challenges, values, qualities and resilient character, all of which have made Mavis the amazing woman and community leader she is today. The life story of Mavis Stewart MBE is designed to teach us all about the importance of positive role models and embracing our own qualities, identity and characteristics in order to be the best we can be, and to teach this to the next generation. The event includes a buffet reception of Caribbean delights as well as exhibition stalls. BelEve UK is a Social Enterprise that bridges the gap between aspirations and reality, engenders change and brings solutions to issues affecting young women. Winner of multiple awards, Black 100+ includes Exhibitions, Legacies and Development Programmes designed to educate, inspire and empower people to be the best they can be. Eshé Media is a PR company, specialising in tailored strategies for charities, social enterprises and small businesses in education, the arts & culture film and media disciplines.